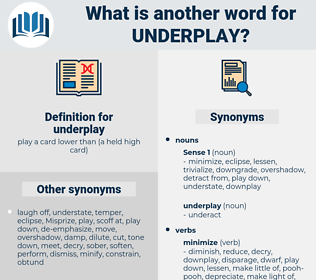 What is another word for underplay? underestimate, downplay, undervalue, trivialise, underrate, overlook. compliment, build up, lengthen, overestimate, commend, exalt, grow, praise, overrate, prolong, develop, strengthen, increase, approve, enlarge, expand, raise, maximize, laud, extend. blow up, play up, explode.